PANAMA CITY, Panama -- Boxers made weight for the exciting boxing show featured as part of the activities for the ongoing 31st WBO Convention at Hotel El Panamá. One WBO World Youth strap, plus two WBO Latino titles between young action-pack boxers are in play to thrill fans and attendees to the convention Wednesday evening (Oct 31) at the push Centro de Convenciones Vasco Núñez de Balboa here in the beautiful, warm and friendly seaside Ciudad de Panamá. 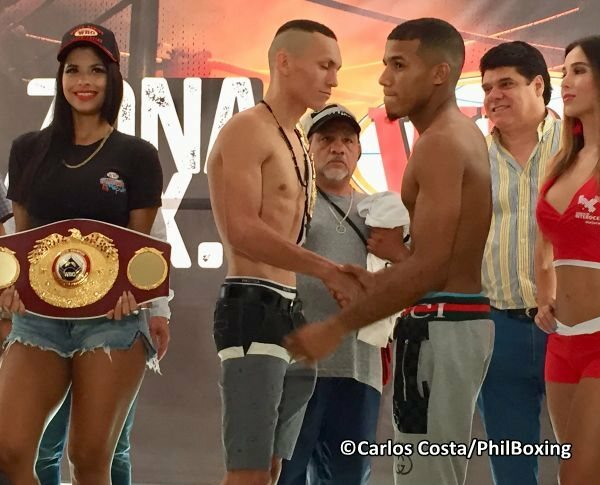 In the main event, world-ranked WBO Latino Super Featherweight champion Francisco Fonseca (22-1-1, 16 KO's) of San Ramón, Costa Rica, weighed-in at 129.75 pounds for the second defense of his Latino belt against heavy-handed challenger Yohan Vásquez (21-2, 18 KO's) of the Dominican Republic who came-in at 128.50 lbs., an action pack rumble in Panamá that promises fireworks. Francisco Vasquez and Joan Fonseca shake hands ahead of their rough runmble for the WBO Latino 130 Belt. In addition, undefeated, promising, young featherweights, Jean Carlos "Chapito" Rivera (15- 0, 10 KO's) of Puerto Rico made 125.75 lbs., while Jason "El Alacrancito" Sánchez 12-0, 6 KO's of New México scaled-in heavy at 128.5 lbs., two and half pounds above the limit of the division in a battle for the vacant WBO World Youth Featherweight crown. However, the title is only in play for Rivera, the only one who made weight. Fans will also see in action Aztec warrior Victor Proa (29-5-2, 22 KO's) of Monterrey, Nuevo León, Mexico, weighing-in at 121 lbs against tough Yenifel Vicente (33-3-2, 25 KO's) of the Dominican Republic who made 121.5 lbs. Their private war is for the WBO Latino Super Bantamweight belt. 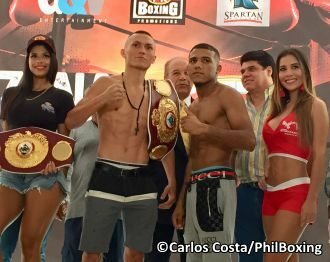 Moreover, unbeaten Argentina fighter "El Avión" Agustín Gauto (9-0, 5 KO's) weighed-in at 107 pounds to climb up the square ring to take on dangerous Jose Antonio Jimenez for the vacant WBO Latino 108-pound strap. Plus, a non-stop action-packed 6-rounder preliminary clash between two young Panamanian fighters is set crank up "Copa Cemento Interoceánico." Undefeated Jaime Valdespino (3-0, 2 KO's) of Curundú takes on Eliécer Tenorio (2-2, 1 KO) of La 24 de Diciembre, Panama. The winner will fight again in the co-main event of next fight card "Box Zona 4" in Panama. In attendance at the boxing event in Panama will be Philippines GAB Chairman Baham Mitra, Filipino promoter Kenneth Rontal, Philboxing.com creator Dong Secuya; and GAB judges Danrex Tapdasan, Edward Ligas and Carlos Costa. This exciting boxing event during the WBO 31st Convention is a production of Panama promoter Diego Victoria of G&V Entertainment in association with Puerto Rican Peter Rivera of PR Best Boxing Promotions. Fights Start at 7 PM. The author Carlos Costa is a Panamanian Reporter based in Cebu, Philippines. He is attending the 31st WBO Convention in Panama. Carlos can be reached by email: Carlos512@hotmail.com and WhatsApp: +639184538152.